I have an ancient food processor. Tom’s aunt gave it to me about 30 years ago, so it is probably 40 years old. It works fine, but due to either arthritis or carpal tunnel, I often can’t get the bowl and lid on and off. I started looking for a new one, and based on ratings bought the Cuisinart 9 cup food processor. If I couldn’t get the bowl on and off, I’d return it and try again. I wanted to try it out with a new recipe. Trying to avoid processed (no pun intended) foods, I decided on a cheese cracker recipe. 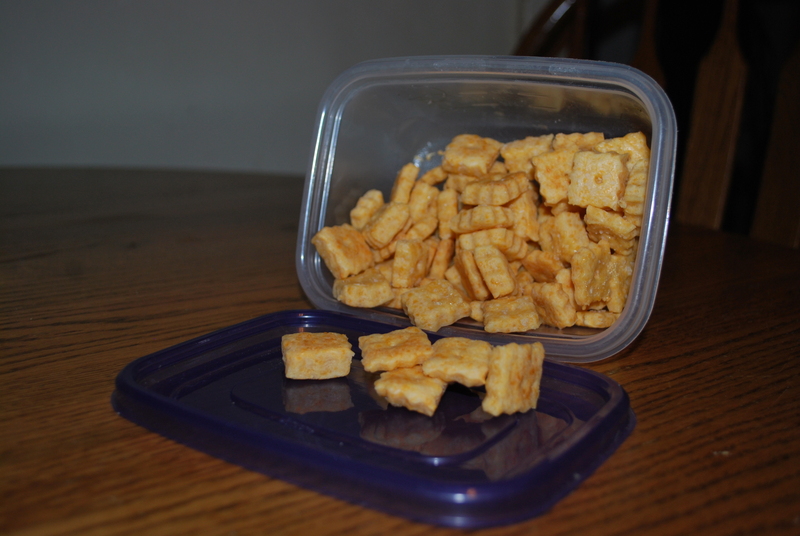 These are one of Tom’s favorite snacks/lunches. I found this recipe on Yahoo, and saved on Pinterest so I could find it again. The instructions were easy to follow, and they turned out well. Things I would do different: roll thinner, try different cheeses, use a little less salt. This entry was tagged cheese crackers, cooking, food processor. Bookmark the permalink. Awesome! Can you share the link to the recipe? Just click on the underlined word Recipe.